It seems almost surreal but the US equity markets seem to be keying of the Greek debt market. 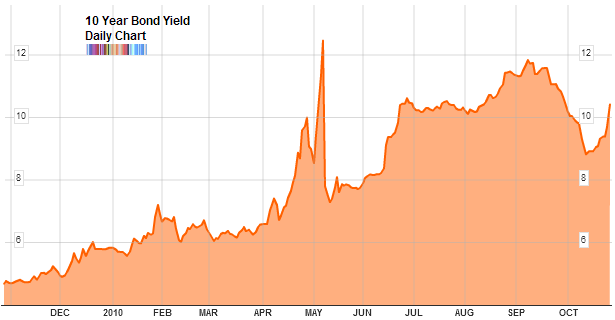 Or perhaps the wider European debt markets and I’m just using the Greek bonds as a proxy. Whatever the case, for some time now, this tell has been giving uncanny signals a few days to a few weeks in advance. Whenever we see Greek bond prices fall (and yields rise) the US equity market shortly afterward does the same. I’ve been watching this since spring and although I’m not sure how exactly to explain it, the correlation is clear. The most recent move in Greek government bonds is due to the admitted budgetary shortfall that will not allow them to meet the EU’s provision that their deficit be 15% (or less) of their GDP. This was a target that Prime Minister Papandreou claimed would be met just a few weeks ago. In a shocking bout of honesty, the Finance Minister Papaconstantinou said, “We are pretending collectively as a country to have a tax system. We don’t.” The large fixed income manager PIMCO is so pessimistic about their prospects that they believe Greece will default within the next three years. As a result the 10 year bond yield is now 10.41% and the Greek 2 year bond (chart not shown) has reached a yield of 8.71%. The last time Greek bonds fell was in August; the S&P 500 index responded by falling in sympathy. Then in early September they rallied and stock prices rallied with them. This isn’t the only flashing red light on our panel. The AAII US retail investors mood took a decidedly giddy turn this week as the bullish camp rose above 51% for the first time since May 2008. It is very unusual to see the majority of the survey respondents believe that stock prices will be higher in 6 months’ time. Historically this has been a very poor time to be long stocks. More in tomorrow’s sentiment overview, including all the other sentiment surveys and indicators. Question - how can the retail investor sentiment be high, when stock fund outflows are also high? Doesn’t this mean that optimistic people are nonetheless selling their stocks? It definately seems to be getting interesting. Steve, thanks for the charts. You’re right, as I alluded to, I think this is more about the wider views on Euro risk and not limited per se to Greece. It just happens to be a good proxy for the rest of the Euro markets. Hey Babak, great work as always. Just a small point. As far as I can tell the AAII bullish reading was 50.89 on September 16th. And also above 50% in August 2009. Noname, yes and no. In mid September the AAII bullish readings did creep above 50% and in mid August 2009 it did again. Perhaps I wasn’t clear but I’m thinking of the relative bullishness (the bull ratio). Oh, and I meant to say “above 51%” - not 50%. Corrected now. Frontrunning of qe seems to be playing havoc with all measures. I think TIPs and gold best reflect investors’ sentiment for inflation and that fixed income Treasuries are merely reflecting prospective Fed buying rather than ‘deflation’/'double dip’. Ditto extreme sentiment measures. Frontrunning by investors has made them very bullish. This could get even more extreme depending on the size and shape of whatever qe is announced. My guess is that having down played expectations a little of late using words like ‘cautious’ deployment of extraordinary policy, Bernanke will in fact want to shake the tree to get everyone’s inflation expectations up. He didn’t want the actual announcement to be a damp squib did he? What does that mean? I guess it means a larger than latterly expected qe programme and it’s up, up, up on the back of Fed buying. Nice article. Credit default swaps all across Europe are once again rising. Actually, Bloomberg had a nice summary article of all the European banks under liquidity pressure once again. They seem to be hooked on ECB critical lending facilities like a heroin addict. As we all should know, the stress test did nothing at all to help the situation. Like you said in your post, it is starting to impact Western equity markets from US to Europe, most of which have printed a bearish gravestone (inverted hammer) on October 25th (Monday of this week). Financials are still struggling. However, what is interesting to note is that majority of Emerging markets in Asia have already started to top or sell off last week or even as far back as 15th of October. The liquidity starts drying up in emerging market complex, as soon as the US Dollar starts to show any signs of bottoming out. Same goes for certain commodities as well. Just look at Crude Oil or Copper, which seem to be rolling over. Also to note is that large caps (The Big Dow 30) have experienced a much stronger rally than small caps (Russell 2000), since Jackson Hole speech. This shows signs of investor cation, at least the way I see it, because small speculative stocks should normally rally much more under normal “bull market conditions”.